We have been at anchor in Prickly Bay for over 2 months. Cruisers here are required to renew their cruising permit monthly; we are now on our third. Time spent reminds us that boats like to move and transport. Therefore, we are formulating a plan and expect to leave in 3 weeks. makes having either wind or solar power essential. Those of you who thought Atalanta needed a more traditional dodger and bimini (including Richard) will appreciate the canvas work Turbulence has completed. Rodney and his crew did a wonderful job of making Richard happy with a new dodger while still enabling Kay to keep dry and/or warm in the cockpit with an enclosure. 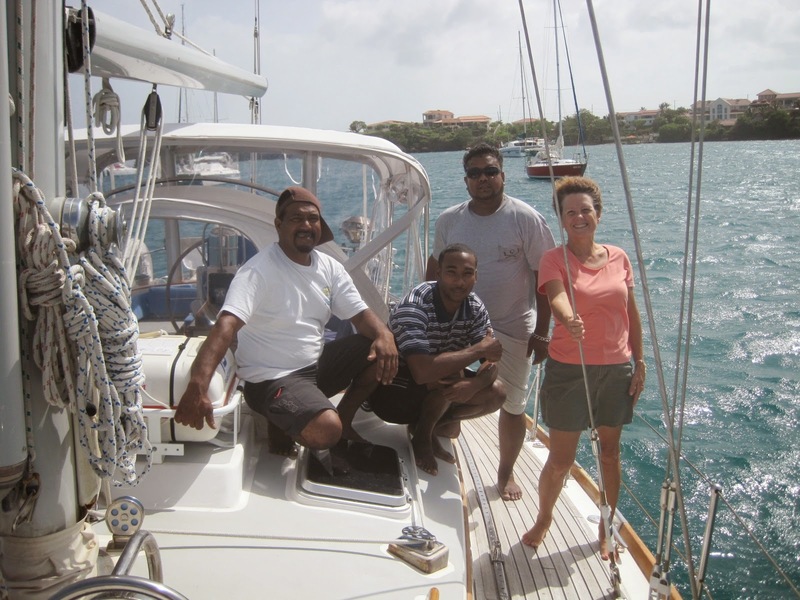 Our first destination after leaving Prickly Bay will be Chaguaramus, Trinidad where we will take a berth at the Crews Inn Marina for a week to explore the island and provision for our push south to Suriname. We will sail along side Anne and Tony on Argosea for the 500-mile passage to this beautiful yet somewhat remote destination. Suriname has little tourist infrastructure but it is a safe and beautiful country that welcomes visitors to its shores. In its abundant rainforests we hope to be fortunate enough to spot unusual tropical plants, howler monkeys and maybe even a toucan or jaguar. We’ll tour for almost a month before heading north to Guyana, another remote country dominated by rainforests and rural landscape. We are not sure how long we will remain in Guyana but when the time is right, we’ll return to Grenada. Then perhaps heading north to the eastern Caribbean or sailing west to Panama will be next on the cruising itinerary. This adventure becomes ever more interesting as we travel into territory that few journey through. In the meantime we continue with dominoes, yoga, tai chi, drumming lessons, swimming, diving, socializing, and getting ready for CARNIVAL!